Its tax saving season and all the insurance companies launch several products targeting people who believe in last minute tax saving investments. Bharti AXA Life has launched a major advertisement campaign named “confusion ka end” around its Invest Once Plan. This post gives a quick review of the “Invest Once Plan” and put “confusion ka end”. The chart below gives the eligibility for Bharti AXA Life Invest Once Plan. Bharti AXA Life Invest Once Plan – Who can Invest? Now the question is should you invest? The Bharti AXA gives investors 4 reasons why they should buy this plan. We check if the selling pitch really makes sense. By default the plan offers 125% of the premium paid as sum assured on death for less than 45 years and 110% for 45 years or above. You can further enhance the insurance part by paying more as mortality premium. If you select No – you get partial tax benefit u/s 80C and the entire maturity amount would be taxable. So if you are buying this to save tax, you’ll have to select “YES”. This further increase the total premium by adding mortality premium to enhance the sum assured on death to 10 times the single premium. These kinds of plans neither offer you right life insurance cover nor give good investment returns. Also single premium is inefficient way of insuring. Guaranteed Additions as a % of Base Single Premium is 9% for 10 year term and 7% for 5 year term. This is what confuses the buyers most. The way it’s presented most people think that the above 7% and 9% numbers are same as that offered by banks on their fixed deposits. Unfortunately this is far from truth! If you read carefully, the statement says addition on base premium which means if you pay base premium of Rs 1 Lakh the plan would add 9% or Rs 9,000 every year for 10 years. So at maturity you would receive Rs 1.9 lakhs. What people fail to understand is the Bharti AXA Life Invest Once Plan is offering Simple Interest while banks offer compound interest on their Fixed Deposits. You pay 3.625% as service tax on life insurance premium which is nowhere in calculation. 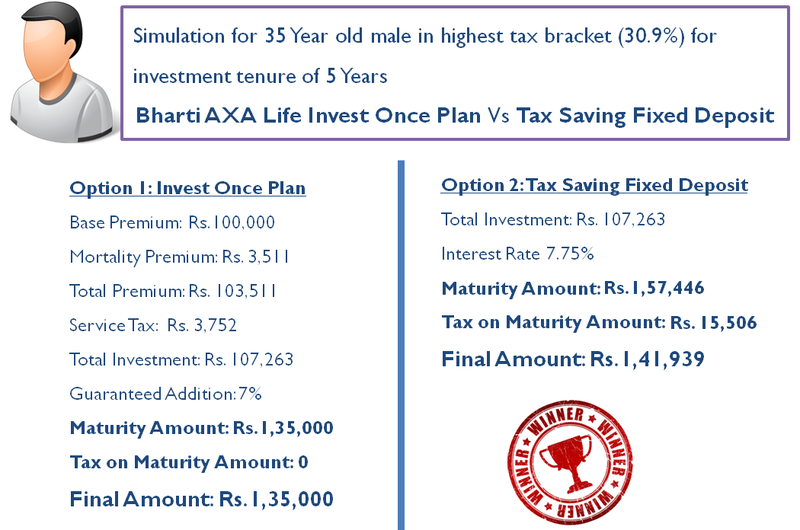 Since Bharti AXA Life Invest Once Plan is positioned against Tax Saving bank Fixed Deposits, we make a comparison. As of today ICICI Bank and HDFC Bank are offering 7.75% on their tax saving fixed deposits. 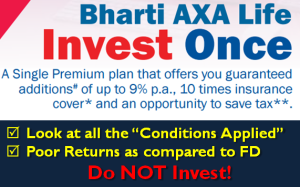 We compare the Bharti AXA Life Invest Once Plan with the offering. The calculation if for 35 year old healthy male (The returns in case of Invest Once Plan is dependent on age of the person, the higher the age lesser would be return). If you look at the surrender value it varies from 70% to 90%. Why would you invest in something which has such long lock-in period without any substantial returns? You are worried about taxes, means you earn around Rs 5 lakhs or more annually. If this is the case, you would need a bigger life insurance cover. If you wanted to buy Bharti AXA Life Invest Once Plan as it gave tax free returns, had life insurance and saved taxes, then we have better options for you. Assuming you do not like risk, invest in Tax Saving Fixed Deposit or NSC (which offers 8.4% interest) and buy term insurance. 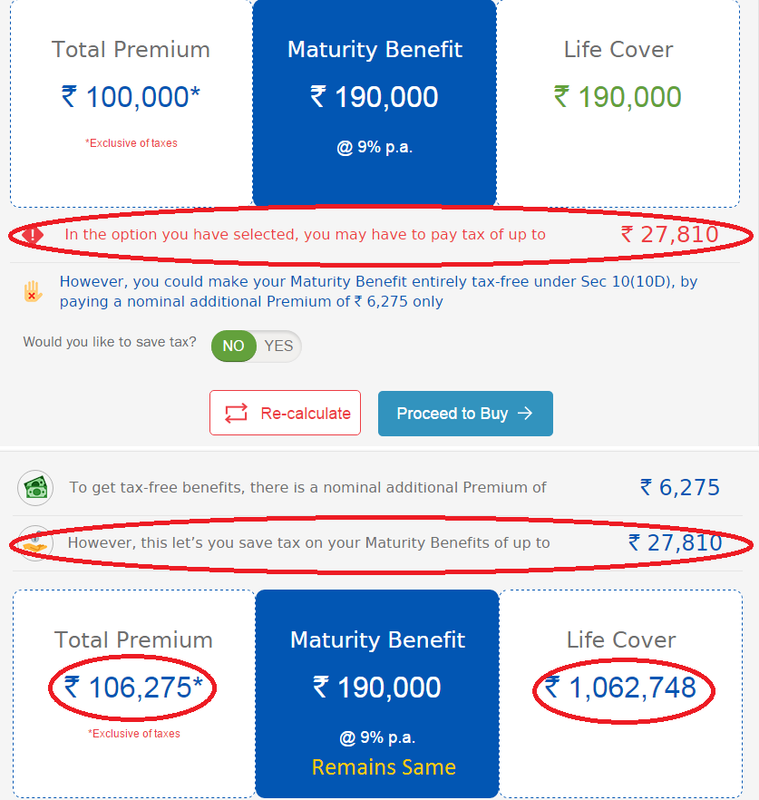 Remember the premium for Rs 50 Lakhs life insurance coverage for 10 years from “BHARTI AXA LIFE ePROTECT” is just Rs 5,300 for 35 year old. You may also get better options and flexibility if you buy term insurance. Bharti AXA Life Invest Once Plan is endowment life insurance plan but is being positioned as one time fixed investment deposit to save tax and get tax free returns. You would come across various such advertisements in coming months from life insurance companies. Keep away from such products and checkout our post on “The best ways to save tax”. Happy Investing and Tax Saving!